“Don’t sell me short” — Bryce Harper on exceeding a $400 Million contract! Players are throwing in their 2¢ on the Bryce Harper/Manny Machado stalemate. Yesterday it was Evan Longoria and Kris Bryant. Players are protecting their turf, but maybe the irrational exuberance of the past has been replaced by teams tanking leaving many veteran players without a seat in the baseball equivalent of musical chairs. But let’s agree to disagree that Harper and Machado could both sign today and take a chair for great wealth that could exceed $300 million for each player. These delays in Harper/Machado signing is more a factor of each player trying to reach record levels for free agents, and they will get it although later than sooner. The top end of the market is not broken, but the lower end has its share of issues. What new analytical tool is devaluing players Evan? Little interest in them? It is called supply and demand Kris. Those are the market forces in effect every year unless you believe in tampering. How many teams were “in” on Max Scherzer? When the price tag is $30 million a year, teams run in a different direction. Kris Bryant ran his mouth without considering that Harper’s own words scared off most of the 30 potential suitors out there. You have to flashback to spring training 3-years ago when Bryce Harper’s radio interview on 106.7 The Fan became words that “turned off” many team owners at that point. Those are words that scare off most CEO’s. While it is clear that many teams are tanking and some of the big spenders from the past seem to want to stay under the CBT cap. Maybe we should also wait and see what happens when Manny Machado, Bryce Harper, Dallas Keuchel, and Craig Kimbrel are all signed to tally up who spent what. Not all owners are making profits annually although their franchises have all appreciated in value except for the Marlins. There is an immense difference between the Yankees and the Tampa Bay Rays and the Los Angeles Dodgers and the Miami Marlins. According to Forbes, every MLB franchise is worth at least a billion dollars except for the Tampa Bay Rays. Paying minor leaguers more money should definitely be considered something that the big league clubs can supplement since most fall below minimum wage based on pay exemptions established by Congress, but painting all teams with a broad brush that “record revenues aren’t being spent on paying players” is an issue with some teams but certainly not others. 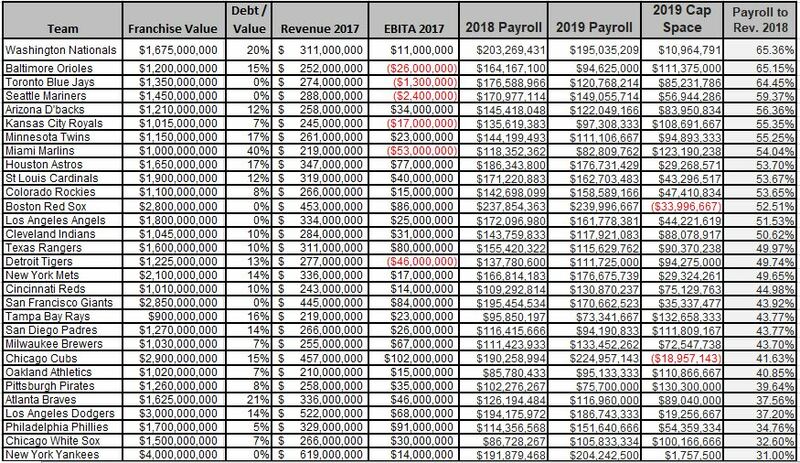 If you want to evaluate the teams which are not spending, Powerboater69 put together a nifty spreadsheet from Cot’s Payroll figures and Forbes 2017 team financials. As we have said for years, the Washington Nationals spend more than any other team on payroll to revenue as was proved out in the analysis. The Nats are not an issue and neither are the Boston Red Sox and Colorado Rockies. On the other hand, the Orioles, Pirates, Braves and Giants are not spending (as of this date) what they should be — but the Giants appear to be in “tank” mode and are rebuilding. The next CBA needs to establish a floor on spending as a function of market size, but baseball also has to fix the definition of revenues and help the teams like Tampa who cannot compete in spending due to revenues. Yes, there is room for both sides to improve spending in the next CBA, but trying to force teams to bid up Harper and Machado is not what players should be arguing. It is like arguing that Bill Gates and Jeff Bezos do not make enough money in the billionaire’s club because there was little interest in buying their products. Come on, really?